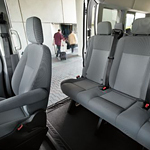 There is just so much that you can choose from when it comes to the 2019 Ford Transit. For one thing, you have a ton of options when it comes to the outside of the vehicle when you are shopping at Donley Ford of Shelby. Every choice has an influence on the experience you are going to get from the vehicle. One of the set of options you are going to have with the Ford Transit is the height of the roof. You can have the low roof, the medium roof or the high roof. This can influence your experience with the vehicle. The roof height options are the beginning of the type of options you are going to be offered with the versatile Ford Transit. You can decide on any feature you want from a flat screen TV to even a kitchen or a bed for the passengers to rest in.